But it can be frustrating as well as detrimental if wrong information goes to the other side. We desperately need a better way to communicate accurate spellings to the other party. To avoid this, there is an accepted international phonetic convention – which all operators know. Ships, Airlines, Armed forces – everyone uses it so that there is no confusion and mishaps. We can also use it… but you many not have it with you when you are calling the helpdesk. So I created a small phonetic converter tool to solve this problem. It is a simple Excel file. Just type your text and it will tell you the equivalent words. This will NOT work on some mobile phone browsers. It is a simple VLOOKUP based worksheet. 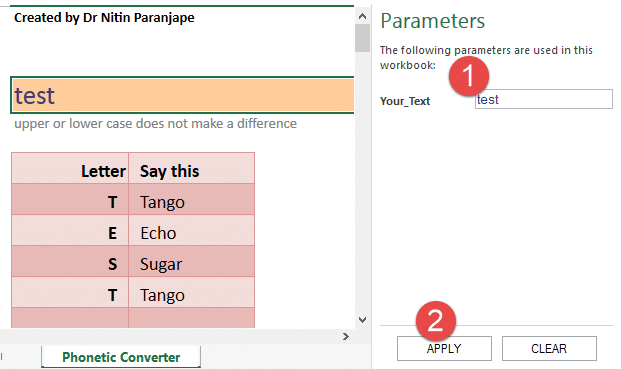 The link given above is showing the web editable version of this workbook using SharePoint. This is one example where applied knowledge of Office can help you in many other aspects of life. Try it out and let me know your feedback. Thanks!